(CNS): Local activist Sandra Catron has been arrested again, this time in connection with allegations of fraud in relation to grants she received for students from the controversial Nation Building Fund. While the police refused to comment on the arrest, which took place at Catron’s home in Newlands this morning (Thursday 12 December) at 7:10am as it is part of an on-going investigation Catron confirmed the arrest. After being released on bail she said it was in connection with an ongoing contractual payment dispute, in which she alleges that the government has not fulfilled its financial obligations to her and still owes her money. Catron said she had filed a civil suit in relation to the issue, which government has not defendedand in which she is now entitled to damages. “These accusations, they have no merit and I intend to fully defend myself to the fullest extent and there’s no doubt I will be successful,” she said. Given Catron’s track record so far, she has reason to be confident as she has already won three courtroom cases against government defending herself, despite not being a qualified lawyer. The arrest, Catron believes, is part of what now constitutes harassment against her, given the history between her and the RCIPS, especially following her courtroom victory over an unlawful warrant earlier this year in which there were shocking revelations about how the RCIPS officers were getting warrants. Catron said the police ironically arrived at her home this morning without a warrant to arrest her for suspicionof uttering a false document and obtaining property by deception. “They are attempting to make a case where there is none. They simply do not even understand what the training is that was offered,” Catron stated about the money she had received for students attending her training company, Micro Matrix, from the controversial Nation Building Fund established by the former premier, McKeeva Bush. Catron said she felt it was no coincidence that she was arrested today after she had called into the breakfast radio show, Crosstalk, on Rooster yesterday morning and mentioned the lawsuit and government’s failure to respond. She said she had also questioned what had happened to the investigation the she had heard was going on against her regarding the fund. “I am not in a position to defend anyone else who received funding under the Nation Building Fund but my experience has been that the process was vigorous and transparent,” Catron stated. However, there have been wide concerns that this was not the case. A recent statement by Premier Alden McLaughlin raised considerable questions about the scholarships given out under the fund. Allegations have also been made that the cash in the fund was allocated at the discretion of the former premier alone and considered something of a political slush fund. It is understood that other investigations are ongoing and that the auditor general will be taking a closer look at the entire fund and how it was managed. (CNS): Fighting to demonstrate the case brought by the four West Bay ladies regarding the closure of the West Bay Road was an infringement of human rights, Anthony Akiwumi accused the QC representing the government of attempting to gut the country’s Constitution and its Bill of Rights (BoR). He said that if the arguments put forward by Richard Keen, QC, on behalf of the government, which was tasked with upholding the Constitution, were allowed to stand and the attempt to mute the Bill of Rights not dismissed, this did not bode well for the future of human rights. The local attorney said it was ironic that the attack on the BoR came on International Human Rights Day. As he responded to the defendants' arguments put forward this week during the trial in front of the presiding judge, Alex Henderson, Akiwumi reiterated his clients’ case that the closure was not done lawfully and it had undermined the human rights of the women who brought the case, as well as the wider public. He said Alice Mae Coe, Annie Multon, Ezmie Smith and Betty Ebanks were not out of time, as the clock in this action could not start any sooner than when government actually made the order to close the road. Prior to that point, the lawyer argued, the situation was "fluid” and there were no certainties, despite government’s claims about what it intended to do. Akiwumi also argued emphatically that the case had been brought before the courts properly and that the new constitution elevated rights beyond those of wider public rights and so a judicial review was not the appropriate legal mechanism for the case. Government had not demonstrated that it had given due consideration to the rights of the people in terms of the environment or justified why it had taken the action it did, other than from a commercial perspective, Akiwumi submitted. He emphasised the women’s point, which was the secrecy surrounding the process and the failure of government to properly consider the impact of the decision on the people it was supposed torepresent. Akiwumi said government had an obligation to protect the interests of its people and their rights and to follow the rule of law, but given the process followed in the closure of the West Bay Road, it failed on all those points. The three-day courtroom battle between Akiwumi and the two leading British QCs came to an end on Wednesday lunchtime and Justice Henderson said he would take time to consider the submissions and written evidence before delivering his judgment on an as yet undisclosed date. (CNS): Although two of the government’s three public pension funds for public sector workers are short more than $178 million, the finance minister has stated that there is no need to panic as government has time and also has a plan for making up the missing cash. Speaking in the Legislative Assembly on Wednesday morning, Marco Archer laid six reports relating to the various pension Actuarial Valuations for both 2008 and 2011 on the table of the House, making them public documents. Archer said the next evaluation would be in January, when the impact on the government’s balance sheet would be updated. 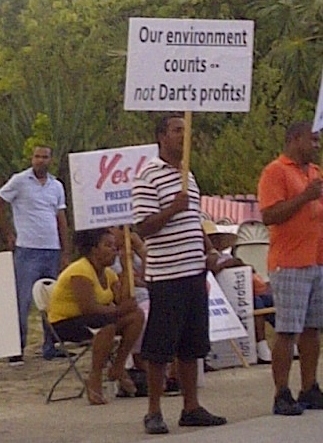 Despite the significant total shortfall across two of government's three funds of CI$178.3 million, Archer said there was no immediate cause for alarm as government has some twenty years to address the shortfall between assets and liabilities of the funds. It will gradually eliminate the shortfall by making extra payments into the funds alongside the ongoing contributions for all public sector employees, the minister told his legislative colleagues. 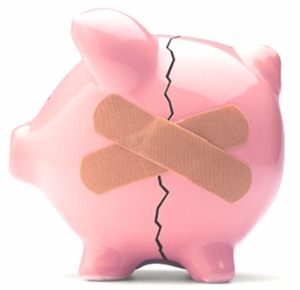 The largest liability is for the civil service fund, which is short more than $165 million, while the MLA’s fund is short by around $12 million and the judicial scheme is now in surplus. Archer said CI$11 million was already paid in this year and central government had agreed to pay a further CI$23.5 million in payments over next two years. In addition, the funds were expecting to earn more returns, and with the tri-annual reviews, the government could keep a close eye on the values. Archer explained that the funds began with a shortfall when the fund was created in 1990 and government inherited some 26 years of liability of existing civil servants who would be entitled to pensions. He explained that at first pension payments to retired civil servants were paid from general government coffers but in 2000 it started paying pensions from the actual fund. Archer stated that there was enough time to address the liability and government was able to pay its regular contributions. He said the 2011 reports contained recommendations for future contribution rates, all of which this current government had now accepted and it would be passing regulations to legitimize the rates. See the six reports below. (CNS): A teenager was sentenced to three and a half years in HMP Northward Wednesday, following his admission to a robbery at a Bodden Town grocery store. The 16-year-old boy, who was only 15 when he committed the crime and cannot be named because of his age, already has a long rap sheet, not least because of his upbringing. This was described in a social inquiry report as “heartbreaking” and down to the “colossal failure of his parents”. The teen was born addicted to crack cocaine and was severely neglected as he grew up, Justice Charles Quin revealed in his sentencing ruling. But despite his terrible start in life, the judge noted that he had to begin taking responsibility for his crimes. The teen pleaded guilty earlier this year to robbery, possession of an imitation firearm and assault in relation to the daylight hold up at the Lookout grocery store in Bodden Town on 28 May. The teen stole over $900 dollars, scared the staff, owner and customers at the store and also assaulted one member of the public who tried to prevent the crime. Although he made his escape on a bicycle, witnesses who spotted him leaving alerted the police promptly and as a result he was arrested and later charged. As he handed down three years for therobbery, another three for the possession of the flare gun to run concurrently and then an additional six months for the assault on the customer, which the judge described as gratuitous violence, Justice Quin said the crimes were very serious. However, he noted that the young man’s spiral into crime seemed almost inevitable given his background and described the social enquiry report submitted to the court as making “depressing reading”. Known to the Department of Child and Family Services since he was born addicted to crack, as a child he was neglected by his mother, who has severe drug and alcohol problems, and his violent farther, who has a long criminal history with over 90 conviction and has been to jail many times. The boy was taken into care by the department when he was very young and while at Bonaventure the young boy ran away eight times. The judge said both parents blame each other forthe situation with their son and take no responsibility for their role as parents. “It is obvious to the court from the review of the SIR that the defendant’s childhood has been devoid of any love, support or guidance,” he said, as he echoed the sentiments of the author of the report. Nevertheless, the judge noted that as the defendant grows older he must take responsibility for his actions. “The defendant must help himself and stay away from criminals and crime,” Justice Quin said. As he handed down the sentences, the judge pointed to the fear that the teen had created with the crime, as well as the terrifying experience for the man whom the young offender assaulted in the store. “It is the sincere hope of this court that this young defendant will be immediately enrolled in educational programmes whilst in custody so that in the less than three years ahead he will equip himself to change the course of his life and become a productive member of this society,” Justice Quin added. (Purple Dragon): Over 90 students of the Purple Dragon martial arts school were recently put through their paces and then honoured with their new grades by Professor Don Jacob, founder of the Purple Dragon martial arts programme, who visited Cayman last month especially for the examinations. The grading process took place over two days at the Purple Dragon dojo (studio) at the Mirco Centre and students from both that location and the programme’s Crewe Road studio were required to showcase their karate skills in front of Professor Jacob. As well as developing his world-famous Don Jitsu Ryu martial arts, Professor Jacob is also a Martial Arts Hall of Famer and martial arts world champion and he visited Cayman in November as part of his worldwide grading tour. Grading is an important part of a karate student’s development programme as the grading process allows them to progress to the next level of their training, as is indicated by an exchange in their belt colour. In total 92 students were graded during the November tour, with youngsters aged 11 years and under making up the majority (71) of those graded, the remainder were pre-teens, teens and adults. New belts achieved were broken down as follows: Yellow 22, Orange 16, Green 19, Blue 6, Purple 5, Red 3 and Brown 21. Cayman Islands Purple Dragon Martial Arts instructor, Sensei Floyd Baptiste, said he was impressed by the high levels achieved by all students. “All students are to be commended for their hard work and perseverance duringthe grading process. In particular, we were really pleased to note that three students actually achieved a ranking higher than the recommended level. Denise Corin, Francine Bryce, Elena Garcia-McLean all moved from White to Green Belt, which is a huge achievement for all three students,” he explained. In addition, three students achieved the hard-fought elite warrior title. Cherie Branch was graded a Brown belt elite, Francine Bryce a Green Belt elite and Tahiti Seymour a Yellow belt elite, another impressive achievement for the group. Proceeds raised at this event, which is sponsored this year by Home Gas, will go towards the school’s classroom modulers project. The tournament is a four-person scramble accommodating up to 72 players in 18 teams; the tournament is open to the public and all are encouraged to enter. Companies and individuals are encouraged to sponsor holes with two types of sponsorship package available: premium holes (i.e. numbers 1,9,10 and 18) cost CI$350 and the remaining standard holes cost CI$250. Bodden Holdings, the parent company of Home Gas, has been involved at various sponsorship levels since its inception. 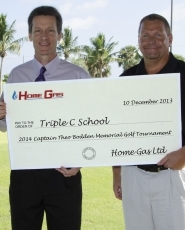 The namesake of the tournament and founder of Bodden Holdings, Captain Theo Bodden, was also one of the founders for Triple C School. Gregg Radley, General Manager of Home Gas, said the company was proud to be part of such a worthy cause. "We believe it is important to give back to the community and what better way than to enjoy an afternoon of golf while raising funds for Triple C School," he said. "As Captain Bodden was a founder of both Bodden Holdings and Triple C, it gives us great pride to help raise funds to support their legacy and many worthy programs." Contact Nathania Mayers, at Triple C School at development@triplecschool.org or call 949-6022 to register or request sponsorship information. 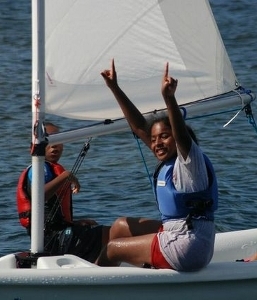 CISA): This much anticipated annual sailing regatta saw close to 50 sailors from Primary schools across Grand Cayman competing in perfect conditions on North Sound. Teams of 6 students from each school took turns to race their boat round a short course and the very close racing made for exciting viewing close to shore.“Students come to the club to sail throughout the year and then every November they compete fiercely for bragging rights in this team competition,” explained Rick Caley from the sailing club. “It’s the team aspect of the competition which highlights the virtues of sailing as a sport. They all help each other to get a good start, take care of their boat and encourage each other in every race,” he added. After 24 races Cayman International School came out on top for the second year running. They were closely followed by Cayman Prep and Savannah Primary. Hope Academy, who were competing for the first time and had only been sailing together for 8 weeks, took a creditable fourth place. Rick Caley thanked the coaching staff for preparing the sailors so well and RBC Royal Bank who sponsored the event for the 15th consecutive year. (CNS): The environment minister has said that the much anticipated and much discussed National Conservation Law will not be the death knell for development but it would not be possible to further amend the law “without rendering it absolutely useless”, as he emphasised the need for this legislation. Presenting the bill to his legislative colleagues on Wednesday morning, Wayne Panton said he was fulfilling a campaign promise and a legacy for the future by legislating the requirement for consideration be given to the natural environment in all future decisions. With no conservation law but many obligations for conservation in the constitution and international treaties, government needed the law now, he stressed. “This bill is not going to be death knell of development. This is about making sure development can continue in a sustainable way,” Panton told his colleagues as he emphasised that the law was not about dictating anything but giving appropriate consideration to the islands’ natural resources and to secure biological diversity. The law will also provide a way to protect endangered and threatened endemic wildlife and their habitats and give environment enforcement officers some powers to actually protect the land and marine environments from poachers. After more than ten years in the making, the minister said it had been through numerous drafts and had been thoroughly reviewed and commented upon. He said it had benefitted greatly from input of a wide cross-section of the community and was essentially a product of three separate governments. More recently it was influenced by contributions from the independent members of the House, who nevertheless remain opposed to the bill. Panton said he was well aware of the opposition in some quarters and said that while they claimed to be in favour of some sort of conservation, they were bent on delaying the passage of any meaningful legislation. “Some people would cut down an ironwood tree so they can sit on the stump to issue proclamations about what kind of conservation they want,” he said of the bill’s critics. “I do not think that it is possible to amend this legislation further without rendering it absolutely useless. “We feel what we have today and what we are about to debate is a bill which reflects a substantial compromise and principles that we should all be able to accept,” he said, adding that conservation of the environment was integral to the success of Cayman’s economy and existence. Reviewing the long history of the bill, Panton said it had been subjected to extensive public consultation that had resulted in this final draft, which included a review by the attorney general for human rights compliance. 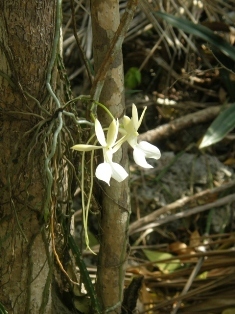 From the constitutional requirements and Cayman’s treaty obligations to the need to preserve a legacy for the future, Panton listed the numerous reasons why Cayman needed a conservation law. “We campaigned on basis that we had no more time to waste and we would be passing the conservationlegislation,” he said, noting that the government was elected on that basis; it was a campaign promise made by the PPM and one it was going to keep. 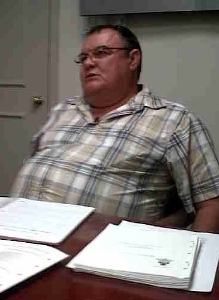 Going into the details of the law, Panton said he did not mind repeating for the 500th time that the bill makes it very clear that only crown land may be designated a protected area and it is Cabinet under the bill not the misinterpreted Conservation Council which has the authority to designate a protected area. Addressing the significant misinformation and what he described as “abuse” repeated by the few that oppose the law, including a local media house, which had fuelled misunderstanding and confusion in order to create unnecessary fear. Repeating yet again that there are no provisions in the bill to take anyone’s private property, he said no land will be designated critical habitat without the support of the owner. If a private land owner says they are not interested in selling land, even if it is seen as an important habitat to protect, “that will be the end of it,” the minister assured MLAs. He said the scaremongering fuelled by those who oppose the conservation law had led to people believing they could be arrested for stepping on a bug if it was a protected species, which was completely untrue. He explained that the protection of species is about creating management plans so they can be helped to survive. All of this will be discussed openly and publicly and will not be dreamt up behind closed doors, he added. 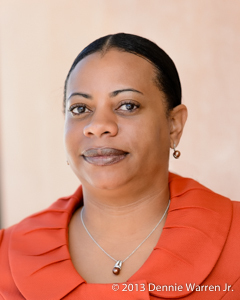 Panton said the council will operate under a policy of open government and complete transparency and will be the first board in Cayman to do so. The minister spoke for over two hours detailing the legislation before he asked members for their support for the legislation and opened the floor for the debate, which is expected to continue this morning. (CNS) Bond Air Services, which operates the EC135 helicopter, the same model that crashed into a Scottish pub last month and killed ten people and the same helicopter used by the RCIPS, grounded the machines this morning. However, the choppers returned to the air in the UK Thursday night. The suspension of services came after a fault was discovered on an EC135 operated by Bond for the North West Air Ambulance in the UK. All Bond's 22 UK air ambulances and police helicopters were affected, the BBC reported today. The machines which were found not to be at fault were returned to service. The aircraft's manufacturer, Eurocopter, said it was not telling other operators of the EC135 to ground their helicopters and the local police air support unit was not impacted. The helicopter operated by Police in Glasgow came down on a busy bar around 10-30 in the evening on 29November. Its three crew and seven people in the pub were killed. An initial report from the Air Accidents Investigation Branch (AAIB) said it had found "no evidence of major mechanical disruption of either engine" on the helicopter. The police here stated that despite the crash they believed the EC135 had an exceptional safety record. But Bond Air Services said on Thursday that one of its EC135 fleet experienced an indication defect that requires further technical investigation during normal operations. "As a precautionary measure we have temporarily suspended service operations whilst we undertake detailed diagnosis. We commenced investigations overnight, are continuing this morning and are in close liaison with Eurocopter regarding this investigation," the firm told the UK media this morning. Eurocopter said the decision taken by Bond did not apply to the rest of the Eurocopter fleet in the UK – a total of 57 aircraft. The manufacturer said it would be working with Bond Aviation and would issue a further statement later. Bond Air Services temporarily grounded EC 135 models last year as well following safety concerns over the receipt of a Safety Information Notice from Eurocopter regarding cracks on the lower hub shaft flange on the EC 135.